Gooday! May I introduce myself. I am Ted Egan, an old bushy who lives in Alice Springs in the Centre of Australia. Since I left my Melbourne birthplace at age 16, I have been fascinated by Australian history, its unique people and the Australian way of life, in this, perhaps the most multi-cultural nation on Earth. For the last 40 years I have been writing and recording songs, filming and writing about the Australian people who to me represent the real ethos of this country. I have just completed my 30th album of songs. 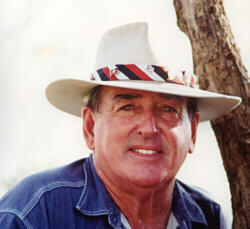 I am "the presenter" of 13 x 1 hour documentary films titled This Land Australia, and I have written ten books. That represents a classy way to make a living. Fancy getting paid for it! I have recently launched my latest project 'GILRUTH', click here for all the details. Due to the electronic miracle named ITunes, you can now purchase over 100 of my songs. Click here for details. Don't forget to complete the mailing list form. I won't ever bore you with too much detail, but I'd like to make your acquaintance.